Lies, Lying, Liar, All in a days work at the USDA. Come on America. There is absolutely no legitimate justification for a civil servant to lie under oath giving false testimony against the very people they are to serve!!! 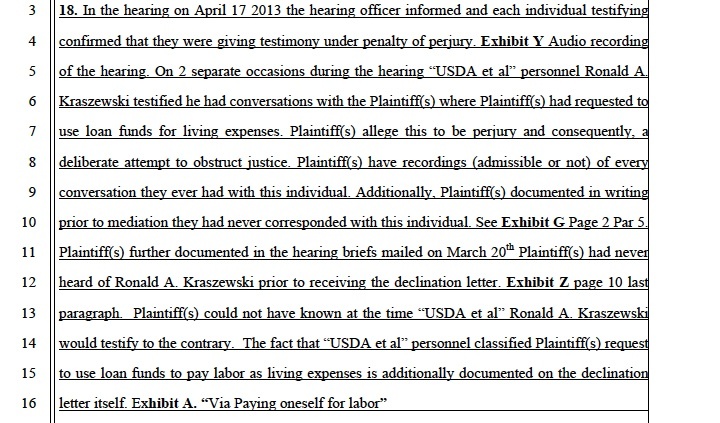 Below the allegation of perjury made against Ronald A. Kraszewski Farm Loan Manager FSA / USDA Chatham VA. In the original and only complaint allowed by the Federal District Court of Danville, VA.
Exhibit’s G, Z, and A can be viewed here in the Complaint Exhibits Folder. The complaint and the exhibits, all but the Audio recording were on Pacer for U S District Court Western District Case 4:13-CV-00054. Listen to Ron in the March 9th Pre Hearing relate labor to Living expenses. Ron’s Ineptitude. 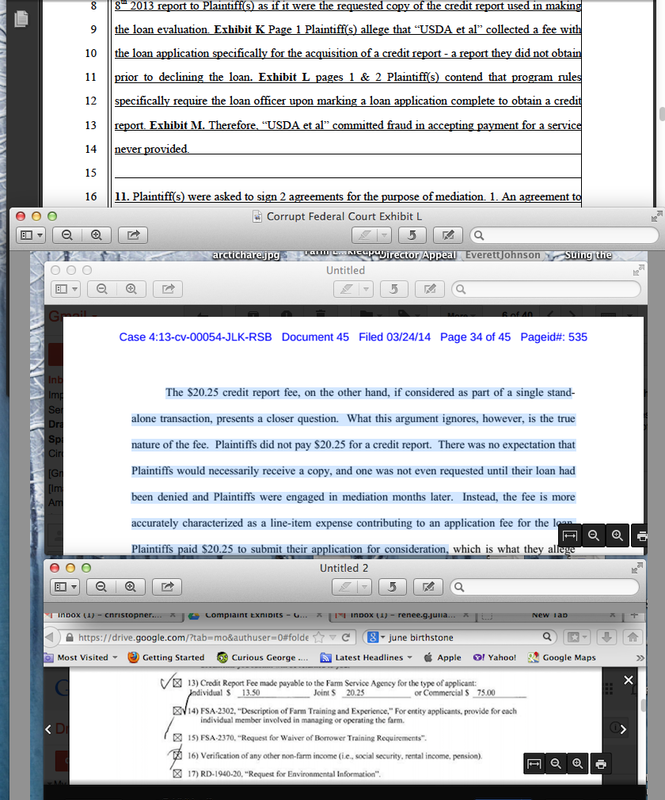 The Suit was filled on pacer with a civil cover sheet against the USDA for Racketeering September 2012. Follow along Please. The definition of predicate act offenses for a charge under this RICO Statue includes predicate act 1503 (relating to Obstruction of Justice) at the bottom of the next exhibit. ‘Google of ‘Racketeering RICO’ and refer to the Cornell law publication this came from. You can read the Complaint See the Pleading with Cover Sheet and Exhibits Here. Mr. Kraszewski testified under penalty of perjury to a hearing officer of the National Appeals Division of USDA an Agency of the U.S. Government. He had conversations with Mr. Julian where, Mr. Julian requested to be paid living expenses. He was asked multiple times by the hearing officer to confirm this and repeatedly made false statements regarding a material fact at issue in the hearing. Listen for your self. It’s a very disturbing life event to have a Civil Servant lying under oath in an attempt to cover for his incompetence knowing that if he is believed it will destroy everything you worked your whole life for. Note that the original declination letter proved that FSA had made the assumption entirely on their own accord AND contrary to the documentation they had been given. Mr. Kraszewski’s lie was an effort to protect a reason FSA gave for denying the loan . Like the allegation made that we requested to pay off real estate debt made without ever pulling a credit report. Debt that did not even exists! And pulled from discussion by the hearing officer. When I asked USDA to address this issue they told me to get an attorney! Now the Federal District Court is granting this crew sovereign immunity, and stating they did not do anything outside what might be a legitimate course of action for their job. Come on America. There is absolutely no legitimate justification for a civil servant to lie under oath giving false testimony against the very people they are to serve on a material fact that would cause serious harm if effective. What kind of justice system lets such an act simply be described as a legitimate job function. Excerpt below was taken from the Judges memorandum of opinion you can find a link at the bottom of the page if you would like to explore the whole ruling. The hearing officer who was factually biased by the Agencies own handbook rules in this case. Covered for Mr. Rigney stating their was a disagreement about what was said. But the Facts and evidence available prove Mr. Kraszewski lied under penalty of perjury. From the Hearing Officers Ruling: see Exhibit AE in the Complaints link if you like to see the whole document. I believe this qualifies as obstruction under the definition provided in 18 U.S. 1503 Influencing or injuring an Officer or Juror Generally! What do you Think America? The Federal District Court Judge of Danville Judge Jackson L. Kiser said the following in his Memorandum Opinion verify on pacer if you like. Update 4-24-2017 The Court fails to recognize the jury is to decide a case and the law is on trial just as much as the case to be decided. judge. The Jury should decide if its just part of the Agencies racket to obstruct justice. See the Memorandum Opinion Here if you like. This is all one big cover up of a corrupt Government Agency America. Think carefully what it means when Government employees are free to make false testimony under oath to your detriment without any ramifications. And Judges are granted the same immunity when they ignore the law! Under Title 5 Chapter 7 judicial review limits the courts review of agency action to a review of the agency record. All events then, occurring in the compilation of the agency record, are directly attributable in a natural and continuous sequence unbroken, by an efficient intervening cause to be testimony before a Federal judge. 18 U.S.C. 1503 ”or” 1505 is there really any deference is it really 1505 “and” 1503? The jury must decide! Remember the court instructed us not to cite Statues, Make Legal Arguments, or Cite cases when filing the complaint and denied any amendment. The USDA is a Racketeer Influenced Corrupt Organization, in conjunction with FSA, NAD, and affiliated state Mediation programs it is conducting a Racketeer Influenced enterprise for the financial purpose of mitigating legal expenses and covering up for the failure of poor management and training. Their protecting employees in the commission of crimes while destroying farmers, businesses, and lives. Read below how the Federal District Court of Virginia the Court of the Traitor Judge Jackson L. Kiser is Aiding and Abetting this racketeering operation. Below is the General Complaint form for Pro-Se litigants found on the Federal District Courts Western District of Virginia web site. The Court of Judge Jackson L. Kiser. Note: the Instructions. Provide Basic facts of your claim. The description of facts should be Specific. Do not give any legal arguments or cite cases or statutes. Before filing the complaint I called the clerks office and complained; I did not find it possible to meet filing requirements with those instructions. The only answer given was, they would take it up with management. Rule 8(a)2. Says the Pleading should contain “a short and plain statement of the claim showing that the pleader is entitled to relief”. Rule 9(f) States “Time and Place: An allegation of time or place is material when testing the sufficiency of a pleading. Rule 15(a)2 States the Court should freely give leave when justice so requires. The best Pro_Se guide we found for the Federal Courts was that of California. It states very emphatically however, a complaint should be 25 pages or less, otherwise its not a brief. Read our complaint it is designed to provide as much about what, when, where, and how it occurred “in time sequence”, as possible and provide specific evidence with the complaints exhibits proving allegations are true but, adhering to the instructions not to make legal arguments, cite cases, or statutes. Read the Complaint. Don’t ask us WHY these criminals did what they did. We’ve been denied discovery for that. But, none of that has anything to do with the discovery along the way that the whole USDA mediation, and Administrative appeals program is a Racketeering Operation supplemented by intentional legal loop holes left in their program operations and an abuse of Sovereign Immunity to protect their criminal(s) behavior. This is a major reason why the courts ruling in our case is so corrupt! This enterprise is an act of treason warring against the Constitution and We The People. The court granted absolutely no leave to amend the original complaint. Told not to site statutes, cases, or make legal arguments how in hell do you make allegations with sufficient specificity, reference sections, tell the whole story in under 25 pages? Told not to make the legal arguments and then denied an opportunity to correct deficiencies primarily a result of the courts instructions is criminal intent to obstruct justice. Throughout the courts ruling, on numerous items in the complaint, The court argues we did not make the appropriate legal arguments. Cite the laws broken or provide sufficient support for our allegations. In opposition to the courts instructions! Additionally, they mock us for attempting in reply briefs for trying to rectify issues caused primarily by those very instructions. I call that Manifest Injustice. Here is one of numerous examples from Page 38 of the courts ruling. Read the Ruling. Having formerly worked in Banking it is commonly accepted knowledge there are only 3 valid reasons under the FCRA to accesses someone’s credit file. If you have a valid application for Credit. If you have provided the creditor with pre-approved credit. If you are currently a creditor. Having denied our application in November 2012 FSA was none of the above in February 2013. Mr James Rigney FSA Farm Loan Officer and Mr. Ronald Kreaszewski FSA Farm Loan Manager claim to be loan officers but fail to exhibit even basic lending industry knowledge. After denying the loan in November 2012 and claiming we were paying off debt we did not have when they never pulled a credit report. We requested they provide the copy we paid for them to obtain. So on February 8, 2013 they pulled a credit report and sent it via US Mail in an act of Fraud proffering it as the one used. I say that was an act of fraud and placing it in the us mail for that purpose was mail fraud. This case was Filed with a civil cover sheet cause of action for Racketeering under the RICO statute 18 U.S.C. 1961 and is and always has been on the courts docket as such. See the Complaint Cover Sheet. Update 4-21-2017– Don’t you think given a judges sworn oath to uphold the constitution he would have an obligation to his oath and the American people to investigate allegations of treason throughly? 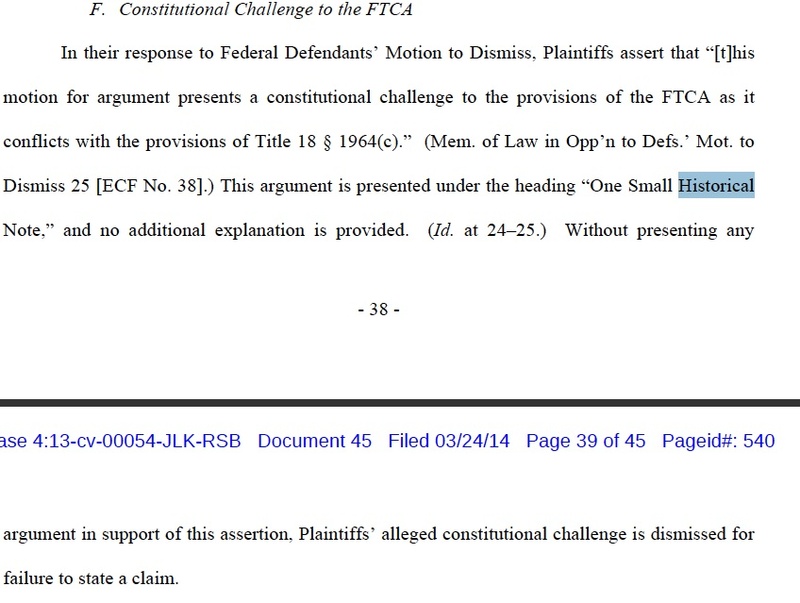 The court instructed us not to cite statutes, cases, or make legal arguments in the complaint. But, the court has dismissed this cause of action without ever allowing the complaint to be amended to correct deficiencies caused by their own instructions. We’ve never had opportunity to plead the RICO requirements. Cite the Violation of predicate acts with specificity as required in a RICO filing. Note; However, the court was provided not only the allegation of these acts but more than sufficient evidence provided as exhibits to prove them to a preponderance of the evidence. Cite the violation of other statues and evidence of uncharged crimes, admissible to prove the existence of the enterprise, A RICO Conspiracy, A defendants participation in both the continuity of the pattern of racketeering activity and other matters. Make the legal arguments to support this cause of action and construct the pattern of activity to which the defendants aided and abetted the commission of the enterprises criminal function. While establishing the requisite continuity of a RICO charge. Establishing the long term pattern of USDA in running this enterprise to the detriment of US Farmers. It’s been going on now since 1994 and decimated hundreds of thousands of lives. Establish the fact this enterprise will continue to operate and commit criminal and constitutional violations of law unless stopped by the Judicial system. Continue its treasonous act of War on Americas farmers and rural communities. If the statue applies to Governmental units it must also apply to Government agencies. Furthermore, it must therefore be considered a congressional abrogation of sovereign immunity when the governmental unit charged is an agency of the U.S. government else the law is inapplicable to employees and agencies of the sovereign. No one is supposed to be above the Law and Government is sworn to operate legally and within the law. Establish the argument that the FTCA is unconstitutional where the charges of a RICO violation are applicable to an Agency of the US Government. It is simply manifest injustice to require a plaintiff to obtain permission from a Racketeer Influenced Corrupt Organization “USDA/FSA” , permission to Sue the Agency for Operating a Racketeer Influenced Corrupt Organization. But Government officials will obfuscate these facts. 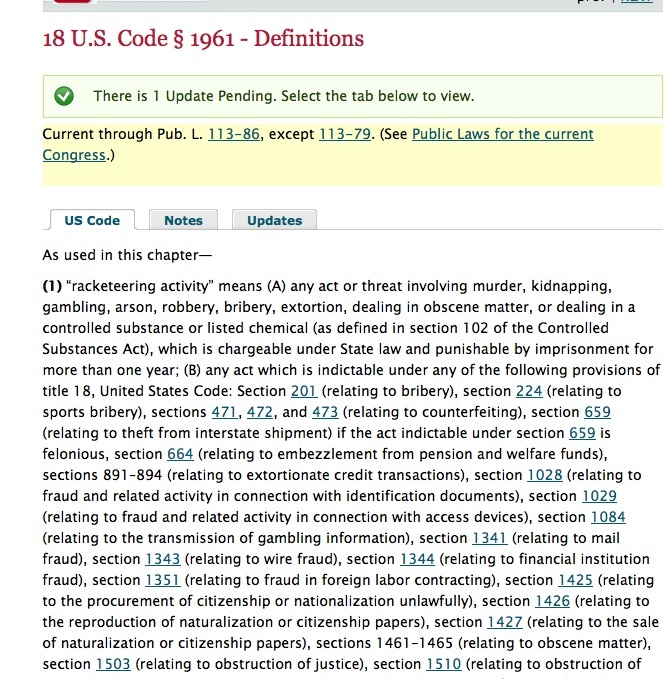 Cite case law to support this charge under Chapter 18 1961. The existence of which is voluminous. However, evidently this court supports the conclusion that Government Agencies and it’s employees are free to run and participate in racketeering operations committing crimes against the people. And, the Judiciary will protect their operations and their criminals from any restitution, allowing them to destroy the lives of those they are paid to serve. The courts ruling and memorandum in support thereof supports this conclusion and is Treason under the constitution and holy adverse to the Constitution of the US and Governmental and Judicial oaths of office and cannons. This Courts ruling completely fulfills, aiding and abetting, the commission of the USDA RICO enterprises financial and participant goals. Segregating the commission of multiple crimes of negligence, fraud, perjury, discrimination, obstruction of justice and denial of service from the unlawful denial of a loan causing significant financial harm. If the loan denial is upheld, there is no financial cause of action for the multitude of torts and other criminal acts. If the Criminal acts are segregated from the loan denial as if they had no bearing on the loan decision then a true and fair assessment of the loan decision is denied and a failure to provide a fair procedure occurs. There are occurrences of negligence and malaice that support the contention the loan denial was erroneous from the start. Cumulatively they are manifest injustice and provide the financial incentive for the USDA to operate this RICO enterprise against farmers a core component of interstate commerce in the United States. Allowing the criminals that committed the acts of negligence, fraud, perjury, discrimination, denial of service, obstruction of justice, corrupt acts, aiding and abetting the commission of the USDA RICO enterprises financial goals, to escape any accountability or responsibility for the corrupt and criminal acts committed against a civilian who sought Congressional mandated government service’s. Devastating the lives of many needlessly and simply walking free from any responsibility or accountability under a widely abused despicable shroud of sovereign immunity. This court has provided a “completed” denial of plaintiffs due process right to present relevant evidence before a fair tribunal with a neutral judge, and to equal justice under the law. Facts show the Judge operated under and with extreme bias to fulfill A complete and utter snub to the fifth and fourteenth amendment rights of Due Process. A legal obligation with the central promise and assurance that all levels of American government must operate within the law (“legality”) and provide fair procedures. The entire memorandum of support by this court, appears written by Attorneys for the defense. I ask you? Tell a Pro-Se not to cite statutes, cases, or make legal arguments. Then deny a single opportunity to amend the complaint. Does that sound like a court seeking to effect justice or a court seeking to protect criminals and obstruct justice? Would you want your case back in the hands of this court if your appeal were granted? The USDA is a Racketeer Influenced Corrupt Organization in conjunction with FSA, NAD, and affiliated state mediation programs like those of Virginia and is conducting a Racketeer Influenced enterprise for the financial purpose of mitigating legal expenses and protecting employees in the commission of crimes. They have such significant numbers of well placed logic errors in their programs they can only be viewed as intentionally placed to provide legal loopholes. Their actions against Farmers corruptly effect interstate commerce in the United States. They are Running a racket, “a scam of intentional design”, stealing constitutional due process rights of Farmers and protecting criminal activities of members of their organization with sovereign immunity. They are manifesting individual employees with no training, no education, no support, and unqualified to preform their jobs the legal support of Chevron deference. The intentional design of which provides individual challengers inequality in the application of rules, regulations, the law and ultimately denial of a fair process and equal justice. They claim nothing to hide yet the rulings they publish contain only the information they want the public to have opportunity to view. All the brief fillings any arguments made by an appellant are completely hidden. They disclose only the summary information “right, wrong, intentionally misstated, even down right false they want seen. Corruptly hiding the Truth. The Federal Court system has been aiding and abetting this Government run Racketeering operation. No its actually TREASON by the highest courts in America! This RICO charge may never have been brought before against the USDA because of the wealth power and corruption of Government. Or because, No one else whom, had ever been victim to multiple predicate acts under this Statute by this enterprise recognized the potential of filling under Chapter 18, 1961. Or most likely because the Victims are primarily poor and unable to get legal help. There is however, thousands of individuals whom have been victims of this enterprise and whose experience only adds significantly to the weight of, and the pattern of, racketeering activity we have encountered and been victimized by. The design, implementation, and intent of this enterprise is, was, and always will be treason by. Bill Clinton and Al Gore.History needs to shed light on the truth. Please follow along with our blog as we continue to critic the courts ruling, provide updates on the case, and begin publishing this story beginning to end with full details. Hopefully by the time we finish the racket will be exposed.